Will you be my alligator? I said I would put dolly up there for her if she wanted. I placed my hands under her arms and lifted her up above my head. 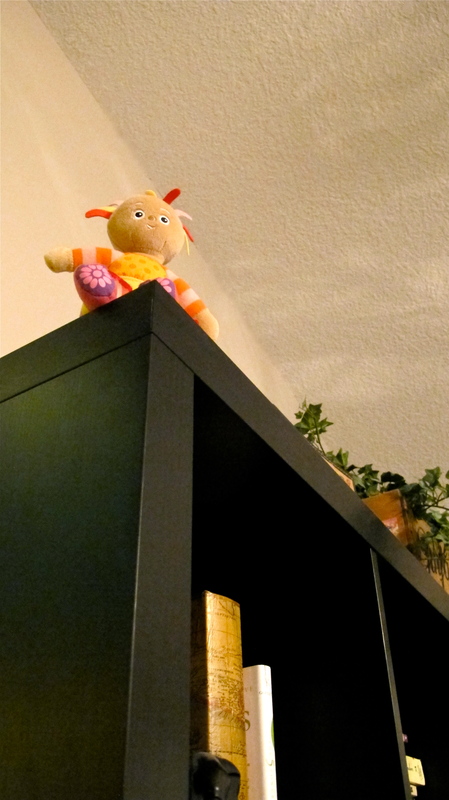 She set her dolly on the high shelf of honour where she would be raised above the threat of the marauding toddler sibling and his friends. Sometimes the Lord gives us responsibilities for those he places in our care. We know our assignment is to seek their well-being, to protect them from potential harm and to raise them up to be who they are meant to be. This can be a daunting task, an overwhelmingly difficult task when often we feel so out of control. I was asking the Lord how I should pray for the people he has placed in my heart when I feel so inadequate, when I am so aware of my own short-comings. Then, as he often does, He sent a child to show me the way. Abba, will you be my alligator and lift me up so I can do my part and bring my loved ones into your presence where they will be visible to the ones who would threaten them, but still be out harm’s reach? I recognize that you are the one who has made everything possible, yet you give me the privilege of working with you with my little bit of mustard seed-sized faith clutched in my pudgy hand. Thank you. You are making me cry! They that sow in tears shall reap in joy, Wantingmore -and for those tears He died. May you rest your head on the chest of the God of all comfort tonight. I so love the wisdom that leaks into us when we open our hearts to a child! I think I need an alligator…. God is still good, and He still loves us. What else could we possibly need? He’ll not let you fail… you’re always aware of your dependence on him, because of your continuous humility, you’ll keep doing his will. Fear not, doubt not! Be wise as serpent and harmless as doves !